Although BMW’s current fame and reputation as one of the greatest automobile manufacturers can be mostly linked to models produced in the last two decades, the history of the marque stretches back almost 90 years and contains numerous achievements that have established it as a benchmark. The origins of BMW trace back to 1913 when Karl Friedrich Rapp, a Bavarian who had been a well-known engineer in a German aircraft company, formed Rapp Motoren Werke in a suburb of Munich. The company specialized in aeroplane engines, however, Rapp found that they were problematic and suffered from excessive vibration. Nearby, Gustav Otto, also an aeroplane specialist, set up his own shop, Gustav Flugmaschinefabrik, building small aircraft. Because of the faulty engines, Rapp Motoren Werke secured a contract with Austro-Daimler, who was unable to meet its demands, to build V12 Aero engines under license. The company expanded too quickly, however, and by 1916 Rapp resigned from the company because of financial troubles. In his place, Franz Josef Popp and Max Friz, two Austrians, took over the company. In March that same year, Rapp Motoren Werke merged with Gustav Flugmaschinefabrik to form Bayerische Flugzeungwerke. It was shortly afterwards renamed Bayerische Motoren Werke (Bavarian Motor Works), or BMW, forming the company we know today. In 1917, BMW’s first aircraft engine went into production, the 6 cylinder Type IIIa. In 1919, using an aircraft powered by its successor, the Type IV, Franz Zeno Diemer set an altitude record of 9,760 metres (32,013 ft). After the Treaty of Versailles was signed in the same year, prohibiting BMW from building aircraft engines, production switched to air brakes for railway cars. When BMW started once again to build aircraft engines in 1922, no fewer than 29 world records in aviation were set with them. The current BMW logo, introduced in 1920, was based on the circular design of an aircraft propeller. The first BMW motorcycle, the R 32, went into production in 1923 at the newly constructed Eisenach factory next to the Munich airport of the day. The R 32 used a flat-twin engine transversely mounted in a double-tubular frame producing 8.5 horsepower at 3300 rpm. The 2-cylinder 494cc motorcycle could reach a top speed of 59 mph (95 km/h). BMW manufactured 3090 of them during its 3-year lifespan. It was 1928 that made history in terms of the BMW car. Produced at the Eisenbach factory, the Dixi 3/15 PS marked the beginning of BMW automobile production. It was built under license from Austin and was essentially the same model as the US Bantam and the Japanese Datsun. The first Dixis used an open roof and were powered by a 743cc 4 cylinder engine producing 15 horsepower. Top speed was in the neighbourhood of 50 mph (80 km/h). In 1929 a new improved version was launched, the DA2, which employed an all-steel body and 4-wheel brakes, and in 1930 the Dixi scored its first wins in motor racing. Total production: 18,976 units. 1932 was the year the BMW AM 4 (Ausfuhrung Munchen 4 Gange – Munich Version 4 Speeds) – a.k.a. 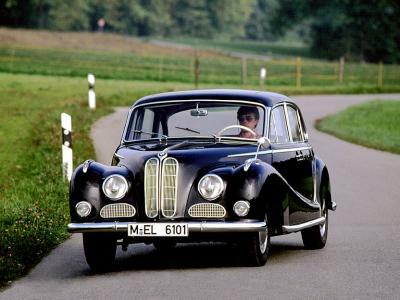 BMW’s first “real” car – went into production. The AM 4, also called the 3/20 PS, was the successor to the Dixis and the first production car to be built entirely in-house by BMW. The powerplant was a 782cc 4 cylinder unit which featured suspended valves and a double chain driving the camshafts, producing 20 horsepower at 3500 rpm and providing the saloon with a 50 mph top speed. The next year marked the introduction of the 303 saloons and the first BMW inline-six cylinder power unit, a configuration that remains BMW’s typical choice even in contemporary cars. The 303 was also the first BMW to use the twin-kidney shaped radiator grilles, another current trademark. Using a welded tubular steel frame, independent front suspension and rack and pinion steering, the 303 was a benchmark in technological achievements. Its 1173cc engine provided 30 horsepower and a top speed of 56 mph (90 km/h). 3 years later, in 1936, the BMW 328 was introduced. 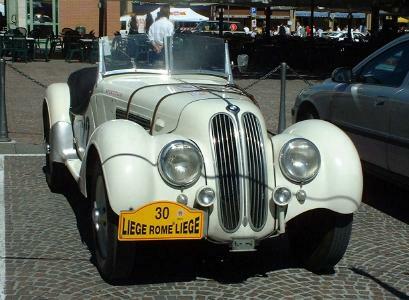 It was the most popular and remains BMW’s most famous pre-war sports car, the successor to the 315/1 (1934-36). The 328 was built mainly for motorsport, where it proved itself successful by winning the Mille Miglia in Italy in its class in 1938, but quickly became a popular road car as well. A curb weight of only 1830 lb was achieved through the use of an extra-light tubular spaceframe and light alloy parts for the hood, doors and tail end. Using a 1971cc inline-6 cylinder engine with three carburettors that produced a healthy 80 horsepower at 5000 rpm, the 328 could reach a maximum speed of 93 mph (150 km/h). 462 units of this classic were produced in total. In 1935 BMW entered the record books once again, this time on two wheels. Riding a streamlined 500cc compressor machine developing 108 hp and an amazing power-to-weight ratio (282 lb curb weight), Ernst Henne set a world speed record for motorcycles of 173.7 mph (279.5 km/h) in 1937. It stood for nearly two decades. BMW’s success was unfortunately short-lived. After the Second World War, the company lay in ruins. Its factories had been destroyed or dismantled and a three-year ban on any production activities was imposed by the Allies in response to the production of aircraft engines and rockets by BMW during the War. The first post-war model, the V8 equipped 501 luxury sedan produced in 1951 was a poor production choice for a country that was also devastated by the war. Demand was low and the 501 did not even come close to meeting BMW’s expectations. It was a totally different approach that started to bring BMW back on its feet. In 1955, the Isetta 250 was launched and participated very successfully in the mini-car era of the 1950’s. It was built under license from the Italian manufacturer Iso and used a motorcycle engine and a single door at the front. The engine was a single cylinder 245cc unit producing 12 horsepower at 5800 rpm and a top speed of 53 mph (85 km/h). During its 7 year production run a total of 161,728 Isettas were built. A couple of years later, with BMW still having no secure financial foothold, one of the most memorable models in its history was introduced. Launched in 1956, the BMW 507 quickly became famous. The light-alloy 2-door bodyshell with a retractable soft top, designed by Albrecht Graf Foertz, has remained timeless as evidenced by the newly introduced Z8, which draws unmistakable clues and its overall shape from it. A large 3168cc V8 engine using dual downdraught carburettors powered the 507 and provided 150 horsepower at 5000rpm, enough for an impressive 124 mph top speed (200 km/h) but not enough to topple its main rival, the Mercedes 300SL. While only 252 examples of the instantly recognizable 507 were ever produced, it remains a symbol of BMW’s struggles and ultimate triumphs during the fifties after the end of the War. The next step in BMW’s evolution and the predecessor to the cars we know today was launched in 1962. The 1500s, which had been developed during the crisis of the ’50s, was another of BMW’s saviours. The excellent suspension and striking design for its time, employing a low waistline with a low-slung engine compartment and rear lid characterized the 1500. A 1499cc 4-cylinder engine producing 80 horsepower at 5700 rpm and providing a top speed of 92 mph (148 km/h) powered it. During its two-year production run sales amounted to only 23,807 units; however, between all of the models in its range (1500,1600,1800,2000) production totalled 334,165 cars. Based on these cars, the first generation 5 series, the E12, was launched 10 years later in 1972. The 3 series was introduced 3 years later and the 7 series 2 years after that, in 1977. In 1990 BMW re-entered the aircraft engine manufacturing business after forming BMW Rolls-Royce GmbH jointly with Rolls Royce. In 1998, after extended talks concerning the sale of Rolls Royce, BMW officially bought the rights to the Rolls Royce name and logo from Volkswagen, with the transition expected to take place in 2003. 1994 brought about another purchase, as BMW acquired the Rover Group PLC. After heavy losses, the company was finally sold in 2000, with Rover being split up from Land Rover which was purchased by Ford. BMW held the rights to the new Mini and the hot-hatch goes on sale in early 2002. Today, the Z3, Z8 and all of the 3, 5, 7 and Motorsport series models continue the BMW tradition of building excellent automobiles with a special emphasis on performance, style and technological advancements. 1992 was another year-to-be-remembered for BMW when it, for the first time, outsold Mercedes in Europe. Hopefully, in the future, the rivalry between these and other makes will persist and companies such as BMW will continue to build great cars. Servicing BMW since 1999, we are a BMW Mechanic and BMW Specialist, located in Perth, Western Australia.